A boom has been undergoing in rare metal prices and has garnered a lot of attention for the "rare earth" Mining industry. With china holding the monopoly for rare earths with large deposits of rare earth in china and china also trying to control rare earth assets in Australia and other countries , they certainly indicate the preciousness and value of this commodity. Rare earths are used in products including magnets, plasma TVs and smart phones, and there is a growing demand for more and more gadgets using these materials. Dysprosium a rare earth , which is processed to make magnets for hybrid cars and smartphones, has soared to $3,600 a kilogram, up from $300 a kg a year ago, while neodymium, also used in magnets, is hovering at about $450 a kg, up from $45 late last year. China, which controls more than 90 percent of the rare earths global market, has restricted rare-earth mining in china and cut exports to conserve resources and protect the environment. The prices of rare earths have more than doubled after China announced plans to centralise control over its rare earth mine assets.The Market Vectors Rare Earth/Strategic Metals ETF (REMX) in the US, for example, has been in an upward trend since last October. The rare earths are likely to be cheaper within China, allowing Chinese manufacturers to buy rare earths at lower prices, which will allow them to transition to selling higher-value goods (like flat-panel screens for tablets, laptops, TVs, as well as batteries for hybrid cars) instead of low-value basic goods and electronics and therefore compete with japan in that sector. The Japanese scientists recently discovered rare earth deposits Under the sea located on the floor of the Pacific Ocean, 3,500 to 6,000 meters (11,500 to 20,000 feet) below sea level but according to analysts developing the offshore bounty could take decades and cost billions, making it little more than a pipe dream. Japan is the largest consumer of the group of 17 metals after China, and the breakneck price jumps have hit them hard. Australia has an estimated 1.6 million tonnes of rare-earths reserves, according to the US Geological Survey, but the industry is still largely in the exploration phase. With feasibility studies underway in Australia in the Northern Territory and New South Wales, Australia could become a major player once again in this segment sooner that it as thought conceivable. What exactly are rare earth metals? They are used to make powerful permanent magnets for lightweight electric motors, phosphors for colour television and flat-panel displays, catalysts for cars and chemical refineries, rechargeable batteries for hybrid and electric cars, generators for wind turbines, as well as numerous optical, medical and military devices. As defined by IUPAC, rare earth elements or rare earth metals are a set of seventeen chemical elements in the periodic table, specifically the fifteen lanthanoids plus scandium and yttrium.] Scandium and yttrium are considered rare earth elements since they tend to occur in the same ore deposits as the lanthanoids and exhibit similar chemical properties. China currently produces and exports 97% of the world's supply of rare earths. The biggest and largest Rare Earth Elements (REE) deposit in the world is the Bayan Obo deposit in China, which has resources totaling at least 48 million tones of rare earth oxides (REO) out of a world total of 95.27 million tones. 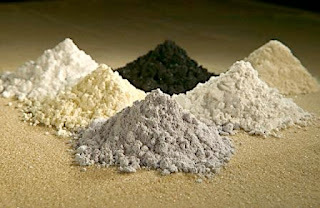 Rare earth deposits, however, are also found in many other countries, including Australia and the USA, and are not as rare as their name implies,even though there is shortage currently. 1. Molycorp: Based in California US next year ramping up to output of 40,000 tonnes a year by late 2013. It is headquartered in Colorado. 3. Avalon Rare Metals: It is a Canadian mineral exploration & development company with its main focus on the rare metals and minerals, headquartered in Toronto. .
4. Rare Element Resources Ltd.: It owns and operates the Bear Lodge mining facility in Wyoming in USA, which contains one of the largest disseminated rare-earth deposits in North America. 5. Quest Rare Minerals: It is a Canadian-based, exploration company focused on the discovery of new world-class Rare Earth deposit opportunities. 7. Arafura Resources - Arafura Resources a Australian resources company derives its name from the Arafura Sea, the body of water which lies to Australia’s north between the Northern Territory and New Guinea. It holds 12,000 km2of highly prospective ground in the under-explored Northern Territory of Australia. Technorati Tags: praseodymium,cerium,lanthanum,neodymium,samarium,and gadolinium,lanthanum (La),cerium (Ce),praseodymium (Pr),neodymium (Nd),promethium (Pm),samarium (Sm),europium (Eu),gadolinium (Gd),terbium (Tb),dysprosium (Dy),holmium (Ho),erbium (Er),thulium (Tm),ytterbium (Yb) and lutetium (Lu). These elements are commonly known as the lanthanide series and are divided into light rare.